Checking the checkbox next to an item below will enable delivery of notifications for alerts or invasions with the corresponding item. Checking the checkbox next to an event below will enable delivery of notifications the corresponding events. Checking the checkbox next to a planet below will disable it from being shown in the fissures list. Checking the checkbox next to an option will allow a sound to be played for those new items. Welcome, if you're here, you want to know how to fish, and what to do. So sit down and buckle up, because we're going on a ride. A grinding ride. 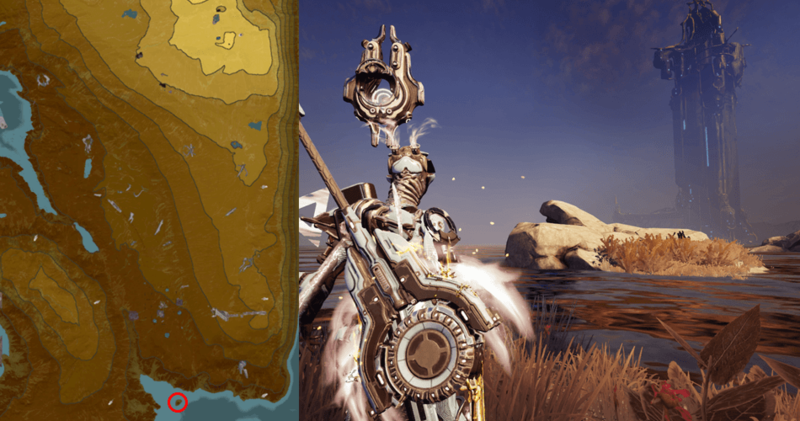 Go to Cetus, do some bounties (by talking to Konzu close to the main gate) to increase your standing until you have at least 500, buy the first spear from the fish trader (fish icon on minimap, close to Cetus entrance), it's called "Lanzo fishing spear". There are three kinds of water bodies: Lakes, Ponds and Sea. They have their own fishes and the spawns are also day-night dependant. Stand on top of that rock on the middle of the pond, you'll have a 360° view of the pond around you, making it easy to farm fishes. 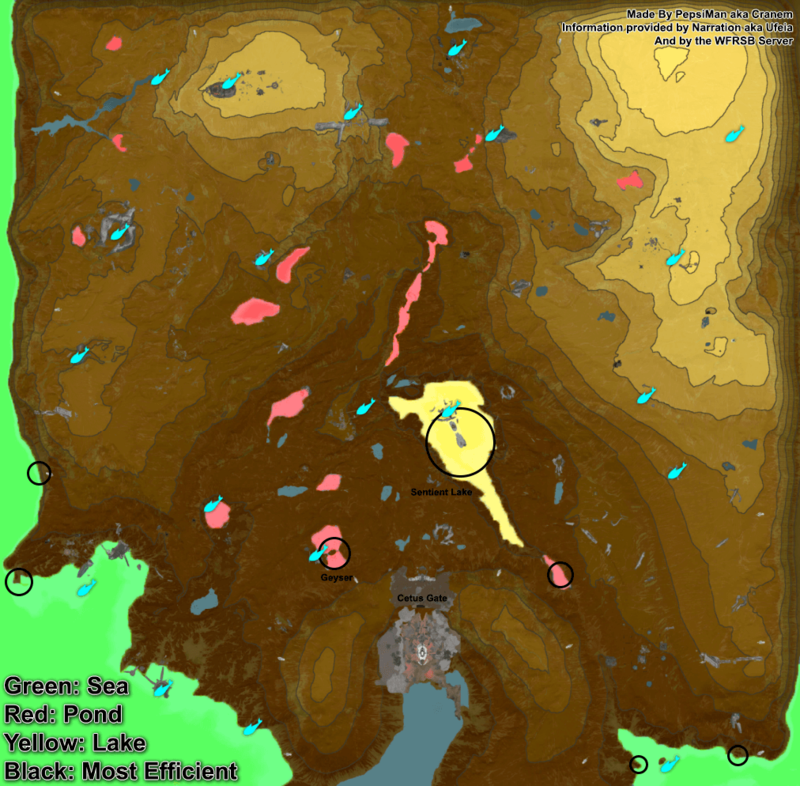 You will be farming here until you get your second (and maybe third} spear, which you get once you reach the next title with the Ostrun, yoUJ can farm multiple fishes here but the best one is the Mortus Lungfish, it gives a great amount of standing and resources, but I'd recommend gathering a bunch of them and using them to max your standing until you level up your title. Currently fishing isn't so great for standing farming, so let's just hope they fix the bounty system. From now on you should refer to the Super Fishing Reference Table for whatever other information more specific on what/where/how to catch each fish. It contains EVERYTHING you need to know about them. To catch some fish, switch to your spear by clicking it on your gear wheel, keep in mind that when you do so, your gear wheel will switch to the fishing wheel that contains your bait and dye (if you have them, probably not now), so the only way to unequip the spear is pressing F (to pay respects to switch to your weapons). 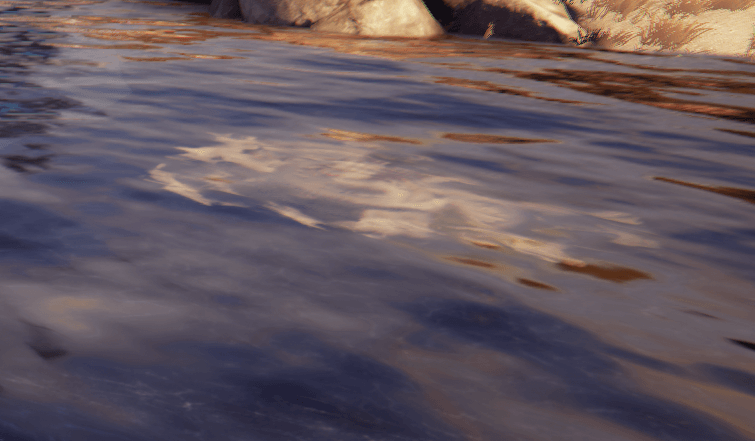 Any splash effects produced in the water will scare the fish away, your sentinel can also cause them if it's close enough to the water. Remember that Fish are completely client-based, which means that different players will see different fish on the same session. The catching mechanic is currently based on HP (health points), so some fish have different amounts of HP, certain spears will deal different amounts of damage to different fish, and some low tiered fish have a very small amount of health, which means they can be caught with any spear. When you go to more uncommon fishes, you will need to pay attention to which spear deals the best damage so you can catch it with 1 hit, and not let it swim away. In the Super Fishing Reference Table, the "Spear" column represents the spear that can capture the fish in 1 hit. All the water surface around this island can spawn "Hotspots", which is the next topic I will explain. 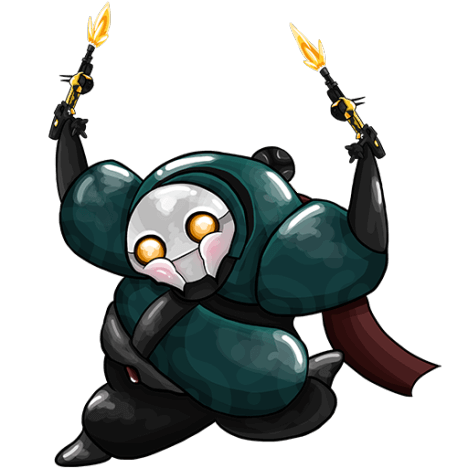 This is the time to learn to use your Dye and Bait, at night, you can catch Murkray, which gives an insane amount of standing and resources that you will need for later on. To do so, you need the appropriate bait for fishes that "Require Bait" in the spreadsheet, take a look at it again to find the fish you're looking for and it's specific bait (In this case, Murkray). For fishes that are not bait required, the proper bait specified will only attract them, making them easier to fish. To craft the Murkray Bait you'll need to catch Tralok, which are common in the sea at daytime. So use the Murkray Bait IN CLOSE PROXIMITY TO A HOTSPOT, use the dye to see the fish better, and enjoy catching your Murkrays. Resource boosters and Smeeta Kavat's charm affect the fish catches, so it's highly recommended! Keep in mind that even though larger fishes give more standing, they don't give extra unique drops, so it's recommended to get the drops (fillet) from the smaller ones, and save the larger fish for standing. Unless you really need standing. 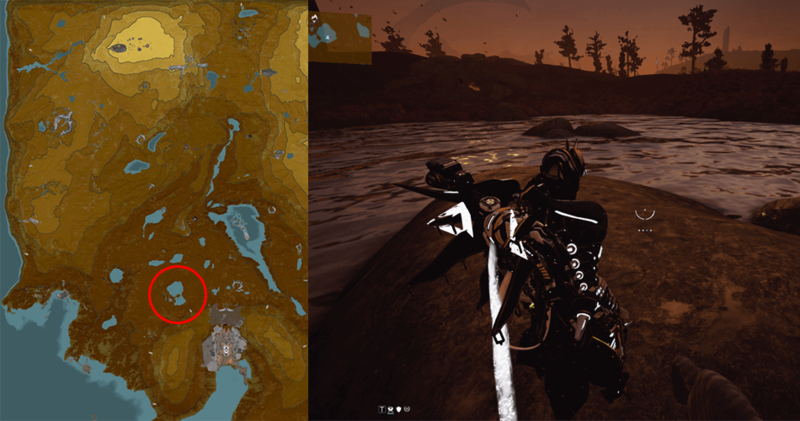 As Honorable mention: The Sentient Lake, the only "lake" in PoE (that we're aware of!). Thanks for reading! Hope it helped. Now go and fish on! 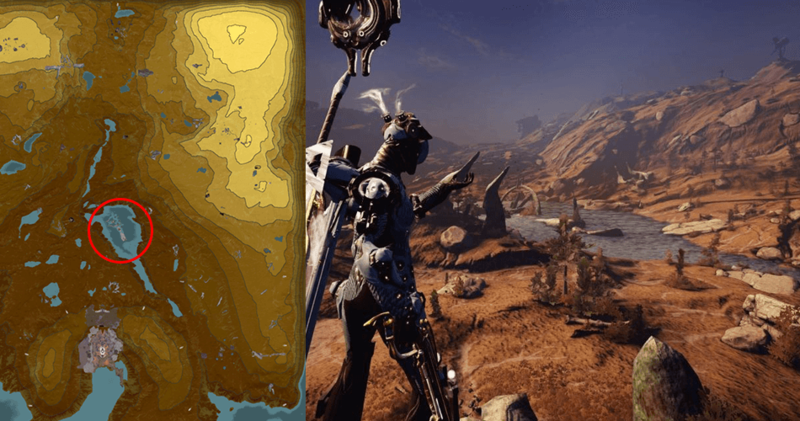 Concepted and Crafted by MainlandHero with contributions from others on the Warframe Community Developers team, especially the work of Tithen-Firion. Warframe and the Warframe logo are registered trademarks of Digital Extremes Ltd. Warframe Hub is not affiliated with Digital Extremes Ltd. in any way. You are entitled to a copy of this project AS IS, and you are free to modify it to your heart's desires. You must include a copy of this license to all future modification and releases. You can read more about the terms of the license here. If you have any issues with timers loading oddly or information displaying strangely, the first and easiest debugging is to clear your cache. You can find helpful tips how to do this here.